Hope everyone’s Holidays were filled with warmth, good food and great company. I spent my Holidays surrounded by family and friends and feel very blessed. Santa was also really good to me and got me a Fitbit One which I’m now totally obsessed with, as well as some new workout clothes from Lululemon (I think you see where I’m going with this). I was cooking up a storm in 2013 testing recipes for both my upcoming cookbook while continuing to post new recipes on my blog each week. There were days I didn’t think I would meet my deadline, but I did! 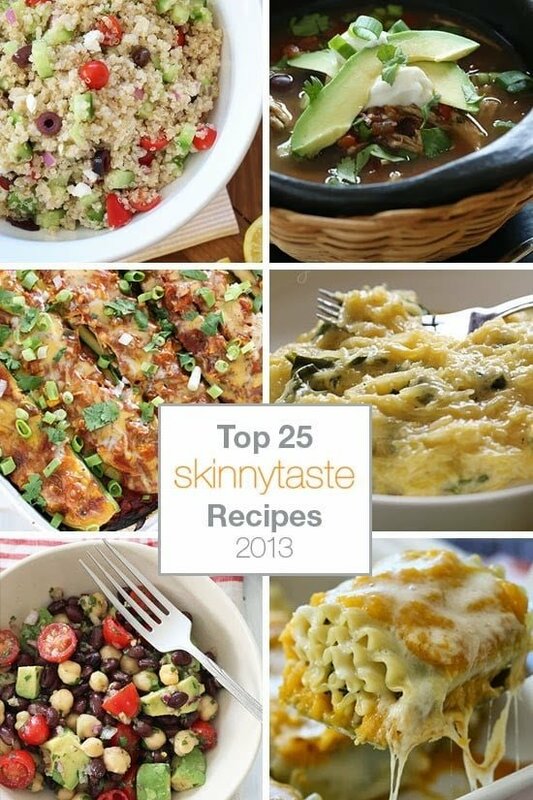 The Skinnytaste Cookbook will be out in the Fall of 2014, in the weeks ahead I’ll be involved with some of the more creative aspects of the cookbook – the photography, book design and cover designs which I’m so excited about. As a Christmas gift to myself I also signed up for 10 weeks of personal training which I started last month to keep me in check during the Holidays. I love every minute of them and will probably continue doing it once my 10 sessions are up. I want to express my gratitude to all of you for being such faithful followers and allowing me to do what I love on a daily basis. Your feedback, emails, comments, the food photos you share with me on Pinterest, Instagram, Twitter and Facebook all make my day and I couldn’t imagine doing anything else so thank you! Have a happy, safe, healthy new year! How are you liking your Fitbit? I just got the zip and it's an eye opener! Will you do a post on it? Thank you Gina, I find it difficult to bring a whole family around to a healthier way of eating and be able to please everyone so I'm excited to find this list going into the new year armed with some great ideas. Have a wonderful 2014.
happy new year from the west coast! i came across your blog midway through this year during my goal of making a new recipe each week in 2013 in an effort of learning how to cook. after trying a couple of your recipes, nearly all of my weekly recipes from that point on were from skinnytaste.com! now, i just want to say thank you so much for your site and that your descriptive, healthy, fun recipes been so helpful in a newbie cook like me! Thank you so much for all of the work you do to provide us with such a valuable resource, Gina! I have basically taught myself how to cook through your recipes and have learned (and lost!) so much! I am looking Really forward to seeing your cookbook on store shelves in the near future and sharing your talents with even more people at that time. My husband and I started Weight Watchers online together in January of 2012. He had more to lose than I did, so I met my goal by September of that year and he needed to keep going. Lucky for us I found Skinny Taste very soon after we began, so I was able to consistently make dishes that not only filled him up while sticking to the program. That is no easy thing, because he's very picky and won't even try food that doesn't seem like what he's used to. With your recipes I got compliments every time and he cheerfully said he'd like to "have that again". And I have maintained my weight for more than a year now, using your recipes for most meals (filling in between with stir-fries from my own garden as much as possible). So now I continue to go first (and, it turns out, last) to Skinny Taste for any recipe I need. They never fail. I serve them when we have family over (we're retired and our kids are older than you) and no one knows how healthy they're eating. My four-year-old grandson loves your food, too. So, we owe you a huge "Thank You" and here's wishing you a very Happy New Year and more continued success. I look forward to your cookbook. My daughter is getting one next Christmas, but she doesn't know that, yet. So glad I came across this blog. I've missed some good ones. I think I'll have the jerk pork for New Years. Thanks! Gina, I have been using your recipes since 2011 and have never been disappointed! You are my "secret" to healthy success. Every time someone asks me how I was able to lose all of my weight and maintain, you are the first words out of my lips! Thank you so much for another fantastic year of recipes! 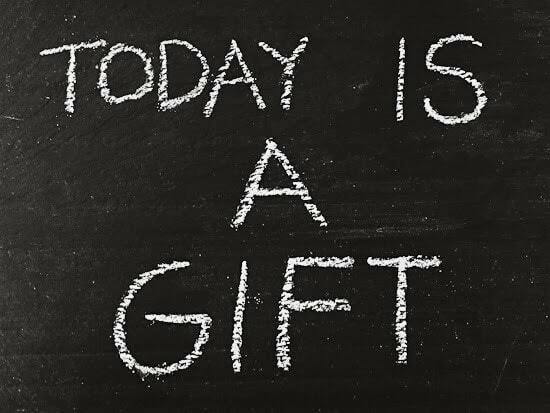 You truly have a gift! I was just going to make the crock pot picadillo for the second time! I made it in November & we enjoyed it alone & in tacos as leftovers! Thanks for your recipes & helpful advice! I am so excited about your book – cannot wait to purchase it! I am addicted to my FitBit One also. I can't wait to look through these recipes. Need to make #25! Have a butternut squash laying around I need to use. Thanks! My favorite this year has been the Cheeseburger casserole. I loved it so much, in fact, that I got the Bobby Dean book as a Christmas present and I can't wait to try out the other recipes in it. It's really a great dish and there's no loss of flavor and you definitely don't feel like you're eating diet food. You will love the fitbit! Great present. I've been addicted since April of 2012. I hardly ever comment, but I just LOVE your blog. I've had so many compliments every time I make one of your healthy recipes, keep 'em coming and I can't wait to get your cookbook! I've made several of these and we loved them! Now it's time to try more. Excited for your book! Yes it has been Kevin! I make something close to your Mediterranean Quinoa, but I haven't been adding lemon…I'm going to have to try it! And the chia pudding looks incredible. Thanks for sharing these recipes again! I notice a squash trend. I love it! Can I ask how much you paid for the 10 sessions of Personal Training??! I bought them through my gym, they were not cheap! Merry Christmas and Happy New Year. Can't wait to try some of these favorites from 2013 that I missed their first go around. Please tell well-meaning gift givers not to support Lululemon. I'm a bit surprised, given your own weight loss journey, that you'd be proud to wear (and mention) clothes from a company whose now former CEO blamed fat women's bodies for the sheerness and pilling of his yoga pants and whose stores shamed women by keeping the size large and size 12 clothes in a heap in the stock room forcing women to ask for them (instead of being able to get them themselves off the racks with the "smaller" sizes. We are who we support. Thanks for making this comment so I didn't have to! Wow I had no idea, that's pretty awful and too bad because I love the way their pants fit. FYI the CEO of lululemon has stepped down and has taken responsibility this is behind them and the company seems to be making changes and moving forward…. thats good enough for me. Yum! Happy New Year Gina. I am going to make the pumpkin muffins right now. Yep! Made the Crock Pot Turkey for Christmas dinner. i have made that deviled eggs with guac and cauliflower bites and its delicious. Will have to revisit other recipes. Happy Holidays!! Since starting my weight loss journey July 29th of this year I have lost 46 lbs. and I owe it largely to your recipes, I love to cook and I love to eat and with your help I am able to do both and still lose weight. Every single recipe I have tried has been amazing! I have many member of my family addicted to your recipes, so from the bottom of my heart, THANK YOU!! I agree the spaghetti squash one is my favorite, too!